The Winglee group has recently succeeded in implementing a multifluid/multiscale model [Winglee et al., 2009] which couples the local Titan model of Snowden et al. , embedding it within the framework of the global Saturn model Kidder et al., . Here Titan is located in the premidnight sector at 21 SLT. The ions from the solar wind, Saturn's ionosphere, Enceladus torus and Titan's ionosphere are all tracked separately. 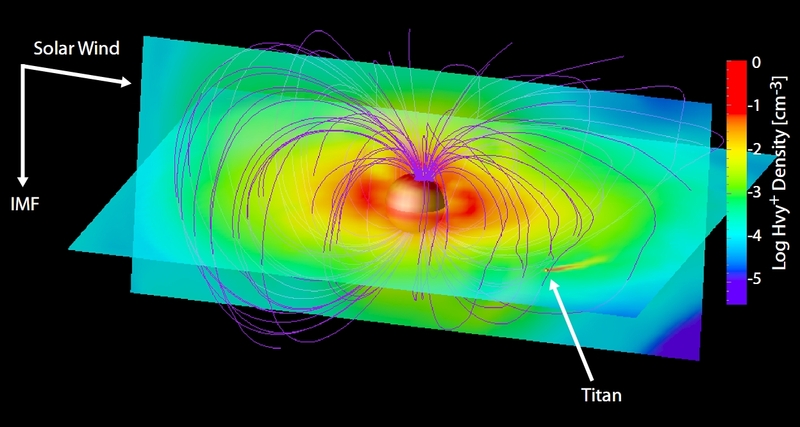 Titan's ion tail is seen to be affected by its interaction with corotating Kronian magnetospheric plasma – but it is itself of global importance and can influence the inner boundary of the plasma sheet.